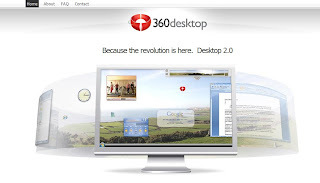 360Desktop is a company that based on Australia, it launched a new desk platform that called "panoramic desktop platform". 360Desktop extends the Windows desktop into a panoramic workspace, you can organize your existing desktop content such as some applications, shortcuts, files, and you can add some web 2.0 stuff, such as videos, RSS feeds, slideshows or widgets on its 360 degree desktop platform. It is a dynamic desktop, gives you more space to your desktop, you can start your applications or videos on the desktop. It is a virtually unlimited desktop and also it looks very cool. 360Desktop is not really open to public, so I can not check it more detail, but it is really interesting. You can see video below.